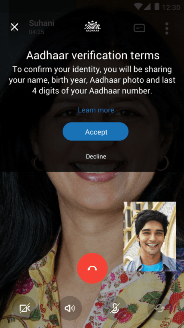 Skype Lite, smallest app to date built for the Indian market by Microsoft, would now come with Aadhaar Integration for user verification. Aadhaar service, one of the world’s largest national identification number projects facilitates users in India to communicate with government, business, and others with a lower potential for fraud. 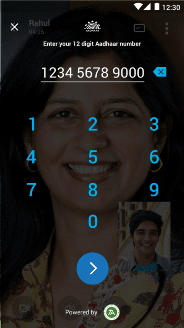 The latest version of Skype Lite with the said integration would allow for the verification of users’ identity online, helping them communicate more securely with others. For important governmental or business calls parties would be able to verify their identity at the beginning of the call to prevent impersonation fraud. To use the service, either of the party can request Aadhaar verification over a video call. In order to confirm one’s identity one would need to click on ‘Verify Aadhaar identity’ and enter the 12-digit Aadhaar number. A one-time password would be sent via SMS for authentication purposes. Once validated, users can choose to share pre-selected Aadhaar information with the other person to confirm their identity. When done with the call both parties would see the Aadhaar verification captured as an event within the conversation. Skype will not store any Aadhaar information and all the personal information including call conversations would be securely encrypted. This unique feature would definitely go a long way in fostering secure confirmation in areas of sensitive business transactions and government communications. It also heralds a deeper collaboration drive between major IT companies and official governmental services for the promotion of a digitally empowered India.